Obviously we here at The Range suffer from an uncurable ache of wanderlust. Hence whenever we find ourselves within a couple hundred miles of a natural wonder we find a way to swing the drive. If you're going to weekend, you should weekend, right? Thank goodness, the Badlands were something else. We rolled to the Cedar Pass Lodge just as the clouds parted for the sun to set and the show to start across the sediment. "After nightfall the face of the country seems to alter marvelously, and the clear moonlight only intensifies the change. The river gleams like running quicksilver, and the moonbeams play over the grassy stretches of the plateaus...The Bad Lands seem to be stranger and wilder than ever, the silvery rays turning the country into a kind of grim fairyland." The CPL cooked up a mean chicken fried steak for dinner and we played cards until well after midnight. The park is a dark sky park which on any other night would be a stunning star show, but on this cloudy night it was more like stumbling out deep into a subterranean cave - a strange, sensory deprivation that (like a vast, sparkling night sky) reminds you how very small you are. 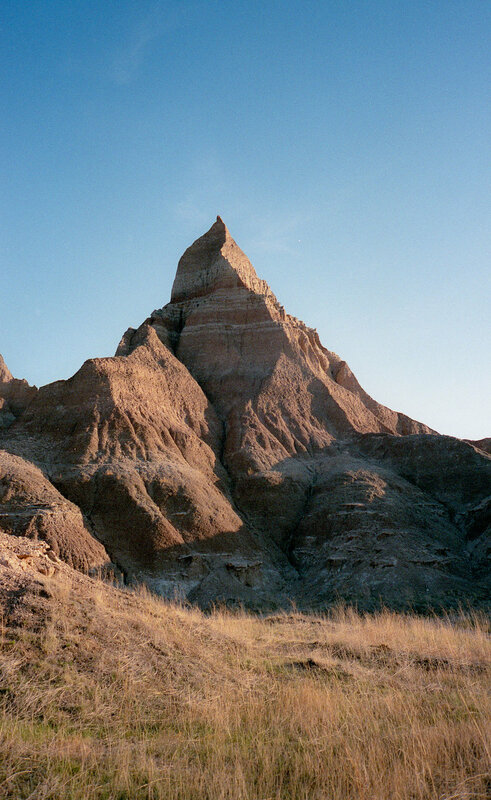 No wonder these Badlands are said to be the sacred ground of the neighboring Lakota tribes. They are sacred indeed. Best 24 hour vacation ever.